FILE - Photos and notes adorn a wall at the Las Vegas Community Healing Garden in Las Vegas, Oct. 16, 2017. The garden was built as a memorial for the victims of the mass shooting in Las Vegas. 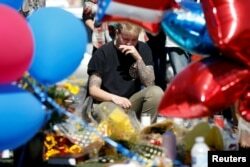 A $31.5 million victims fund that started as a GoFundMe effort announced plans Friday to pay $275,000 to the families of each of the 58 people killed in the deadliest mass shooting in modern U.S. history. The Las Vegas Victims Fund said the maximum $275,000 also would be paid to 10 other people who were paralyzed or suffered permanent brain damage in the October 1 shooting on the Las Vegas Strip. Victims fund spokesman Howard Stutz said the nonprofit expected to pay 100 percent of the funds raised, with payouts beginning Monday. FILE - Bry Thompson wipes away tears at a makeshift memorial in the middle of Las Vegas Boulevard following the mass shooting in Las Vegas, Nevada, Oct. 4, 2017. Police said 851 people were hurt by gunfire or other injuries while fleeing. Students, faculty and staff at a high school in suburban Henderson raised more than $66,000 through T-shirt sales, and a Vegas Strong benefit concert raised nearly $700,000.